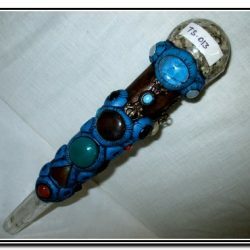 Each of these unique Tibetan Healing Wands was hand-carved in Nepal by Tibetan monks, using the ancient knowledge of the power of crystals. Designed to energise, balance and positively affect the subtle energies of the body, some have mantras and power symbols embedded. 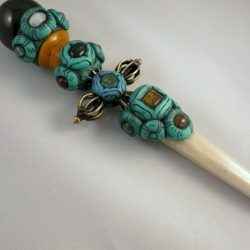 The metal incorporated is the Tibetan blend of the 5 kings of metal – gold, silver, brass, copper and iron, which amplifies the potency of the healing qualities of the wand. 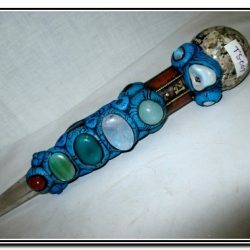 The resin in which the crystals are embedded, is made from coral powder, turquoise powder and rice powder mixed with resin from trees.